This illustration shows a star behind a shattered comet. 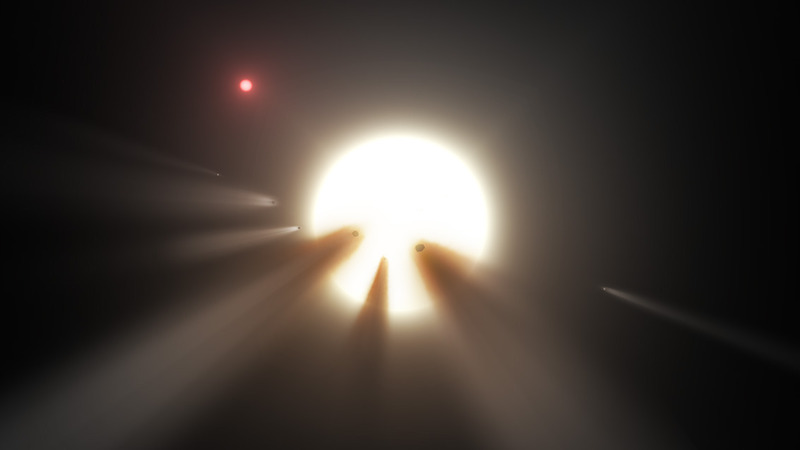 Observations of the star KIC 8462852 by NASA's Kepler and Spitzer space telescopes suggest that its unusual light signals are likely from dusty comet fragments, which blocked the light of the star as they passed in front of it in 2011 and 2013. The comets are thought to be traveling around the star in a very long, eccentric orbit. Larger image. Illustration by NASA/JPL-Caltech. AMES, Iowa – Was it a catastrophic collision in the star’s asteroid belt? A giant impact that disrupted a nearby planet? A dusty cloud of rock and debris? A family of comets breaking apart? Or was it alien megastructures built to harvest the star’s energy? So Marengo and two other astronomers decided to take a close look at the star using data taken with the Infrared Array Camera of NASA’s Spitzer Space Telescope. They report their findings in a paper recently published online by The Astrophysical Journal Letters. “The scenario in which the dimming in the KIC 8462852 light curve were caused by the destruction of a family of comets remains the preferred explanation …,” wrote the three – Marengo; Alan Hulsebus, an Iowa State doctoral student; and Sarah Willis, a former Iowa State graduate student now with the Massachusetts Institute of Technology’s Lincoln Laboratory. Boyajian and the other researchers looked at the data and investigated several possible causes. They wrote the “most promising theory” was a barrage of crumbling comets passing in front of the star. When the Iowa State astronomers studied the star with Spitzer infrared data from January 2015 – two years after the Kepler measurements – Marengo said they didn’t see much. If there had been some kind of catastrophe near the star, he said there would be a lot of dust and debris. And that would show up as extra infrared emissions. So Marengo and his colleagues say the destruction of a family of comets near the star is the most likely explanation for the mysterious dimming. The comet fragments coming in rapidly at a steep, elliptical orbit could create a big debris cloud that could dim the star. Then the cloud would move off, restoring the star’s brightness and leaving no trace of excess infrared light. A team of astronomers led by Iowa State's Massimo Marengo responded to the buzz about a mysterious dimming star by studying data from NASA's Spitzer Space Telescope. Were there natural explanations for the dimming? Or were alien megastructures blocking the star's light? In a paper recently published online, Marengo and his colleagues conclude the dimming was probably caused by a family of comets breaking apart in front of the star.